You have heard, of course, about aging elephants that wander off to die in a specific communal place, a kind of elephant graveyard. It’s sort of the same concept in south central Tucson, in the heart of the Sonoran Desert, where old airplanes instead of old pachyderms come to rest. The Davis-Monthan Air Force Base, within sight of Interstate 10, contains a storage facility known to many locals as the “boneyard.” The facility functions as a holding place to store planes until their ultimate fate has been determined. The Tucson area serves as an ideal graveyard for airplanes. It has a dry, clear and virtually smog-free climate that helps minimize corrosion. It has an alkaline soil so firm that airplanes can be towed and parked on the surface without sinking. These military war-horses have officially been mothballedforced into retirement. Their engines and windows have been covered with tape to protect them against the desert’s sand and dirt. A properly sealed plane can be stored for years in the desert, thanks to the moderate winters and low humidity. An airplane graveyard is not just a fence around airplane carcasses and piles of scrap metal. 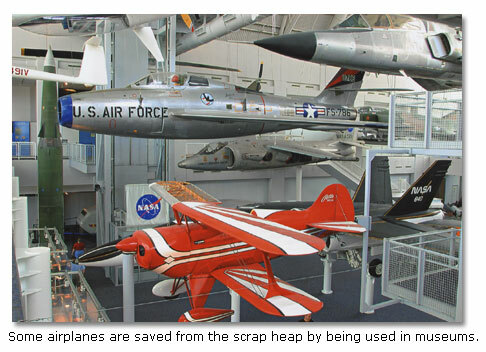 Rather, many millions of dollars worth of surplus parts are salvaged to keep active aircraft flying, including U. S. planes that have been sold to foreign governments. Planes that are to be mothballed, if only temporarily, go through a meticulous process to prepare them for exposure to the desert environment. On arrival, the planes are inspected. Fuel tanks are filled with heavy oil, which provides a protective coating for engine parts. 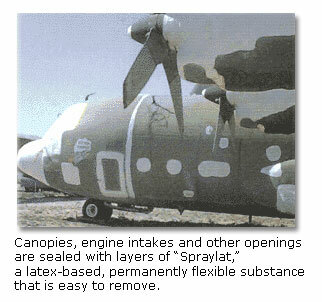 Canopies, engine intakes and other openings are sealed with layers of “Spraylat,” a latex-based, permanently flexible substance that is easy to remove. The top layer of “Spraylat,” which is white, reflects enough solar heat to keep a plane’s interior at nearly the same temperature as the outside air. Without Spraylat, the interior could quickly heat up to 200 degrees Fahrenheit during hot summer days. The coatings protect the plane’s most vulnerable parts against sun, wind, dust and nesting animals. Every four years, the planes are brought into an open hangar for a checkup. Most of the airplanes that sit in desert graveyards today date from the Vietnam era or later. They are divided into four categories, depending on their future prospects. Category 1000 planes are preserved with an eye toward possibly flying again, should international political conditions warrant. Category 2000 planes are maintained for spare parts. Some parts from older aircraft, are available nowhere else. Category 3000 planes are kept in near ready-to-fly condition, awaiting a more-than-likely new deployment. Category 4000 planes are destined for “static display” in museums, town squares or Air Force base entrances. Most, however, will be sold as scrap metal, eventually finding new life as razor blades, soft drink cans or car fenders. Among the most notable Category 4000 planes is the Cold War’s most enduring icon, the B-52 Stratofortress heavy bomber. Most B-52s in the U. S. fleet are headed for the scrap heap under the 1991 Strategic Arms Reduction Treaty (START). After arriving at the Aerospace Maintenance and Regeneration Center, or AMARC, the B-52s are stripped of engines and other parts that might be needed to maintain the surviving active fleet. Then they are towed to a special place to await the executioner’s axa 13,500-pound steel blade, hoisted 60 feet into the air by a crane and dropped. The blade “goes through this airplane like butter,” observes Joe McKinney, AMARC’s chief of treaty compliance. The plane is cut into five separate pieces: first the tail comes off, then both wings, then the fuselage is cut in two, between the wing attachment points. Chopped-up aircraft must remain on the ground for 90 days after they’ve been reported destroyed, to give the former Soviet Union time to verify by satellite surveillance. The only exception to this rule occurs when Russian inspectors come in and release the destroyed plane following an on-site verification. 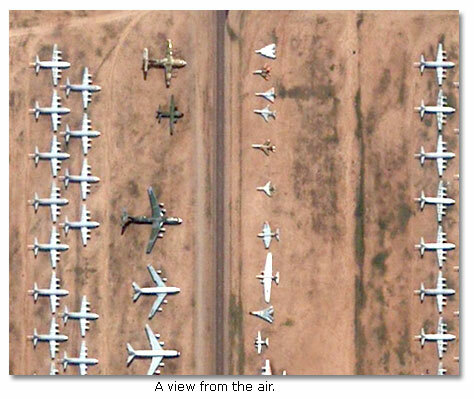 AMARC is situated near the heart of Tucson, at Davis-Monthan Air Force Base, a boneyard for some 4000 airplanes. Under various names, AMARC has performed its unusual mission since it housed B-29s and C-47s from World War II. These older planes are gone, sold as surplus or scrapped. Today, if you want to see old, commemorative airplanes, you have to visit various military installations around the country. Another notable airplane graveyard is located in Southern California, at the Mojave Airport, where retired planes are cannibalized for spare parts. Although fenced off with concertina wire and patrolled regularly, it is still possible to walk up to the fence and peer at the many abandoned aircraft. The airplane graveyard is located at Flightline 1434 in Mojave. Take Interstate 15 North over Cajon Summit toward Victorville, California, then take 395 exit and keep on going up Route 395, you will see huge commercial jets off in the distance. Flightline 1434 wasn’t meant to be an airplane graveyard, but, out of necessity, it has become that. Here there are all sorts of plane makes and models. They were parked here after the terrorist attacks of September 11, 2001, because airlines could no longer afford to keep so many flights in the air as they once had, and because hangars at many U. S. airports were full. The Pima Air and Space Museum: The Museum is open seven days a week, from 9:00 a.m. to 5:00 p.m. Last admission at 4:00 p.m. The Museum is open every day of the year except Thanksgiving and Christmas. Parking is free. The Museum is a pet-friendly facility. A walking tour starts at the Wright Flyer at 10:15. During the tour you will see thousands of aircraft in storage. While individuals are allowed to take photos or video for private use, they are not allowed off the tour bus while on AMARC property. For information on tour schedules and fees, contact the Pima Air and Space Museum at 1-520-574-0462, or visit the Pima Museum website. The military planes that rest in our Southwestern deserts today are a mix of Strategic Air Command gray and Desert Storm camouflage. Even with large parts missing and rough shards of metal hanging in place of the engines, the planes convey a sort of faded dignity. Some sport nose art identifying them, as for example, Yankee Doodle II or Tantalizing Takeoff. Bringing planes to their final resting-place can be an emotionally trying experience for veteran pilots, for example, Colonel William Saunders. He flew a B-29 tanker during World War II. At the end of the war, when the military had a large surplus of aircraft, he found himself parting with cherished planes on many occasions. Former astronaut and military pilot Frank Borman restores and flies old planes. Plane enthusiast George Litzenberg today spends his retirement years helping restore Sentimental Journey, a B-29 bomber flown during World War II. When the last of the B-52s and fighter-bombers at AMARC are scrapped, the planes will disappear from their neat rows in the boneyard as completely as the World War II vintage aircraft that went before. Presumably, they will someday be replaced by the aircraft patrolling our skies today.